Brown cows make chocolate milk, Right? Yeah and red ones make strawberry, the lighter brown ones make coffee, and once in awhile you find a rare one that makes maple milk. Well no that isn't actually true. All cows produce plain unflavored milk. So why are there different colored cows and why would a farmer choose to raise one breed over another if they all produce the same milk? First off the milk isn't all exactly the same, different breeds produce milk with different levels of fat and protein. There are some other factors that come into play as well. Some breeds have higher average production; there is a large range in sizes between breeds; some breeds perform better in certain situations; and then there’s the fact that different breeds are different colors. OK, we know that there are differences between the different breeds but what breeds will I see in the U.S. Depending on your perspective there are anywhere from 5-7 major dairy breeds in the U.S. For the sake of simplicity, I’ll talk about six: Holsteins, Jerseys, Brown Swiss, Guernseys, Ayrshires, and Milking Shorthorns. Let’s start off with the largest most common breed. The Holstein is easily distinguishable by its black and white spotted appearance with either solid black or white also possible. There are even some red and white ones out there. Holsteins are the largest breed, with a mature weight of around 1500 lbs (it’s not unheard of for some to weigh a ton). They produce the most milk on average compared to the other breeds hence their popularity. The first U. S. Holsteins were imported from Holland where the breed originated. The Jersey is the second most common U.S. dairy breed. They are found in a range of colors from very light gray or mouse colored to a very dark fawn or a shade that is almost black. A few key distinguishing features are the presence of a dark tongue, switch (hair at end of tail), and black hooves. The forehead of a Jersey also tends to be slightly concave in appearance. . They are the smallest U.S. breed with an average weight of 900lbs, but produce the most milk as a percentage of bodyweight out of all the breeds. 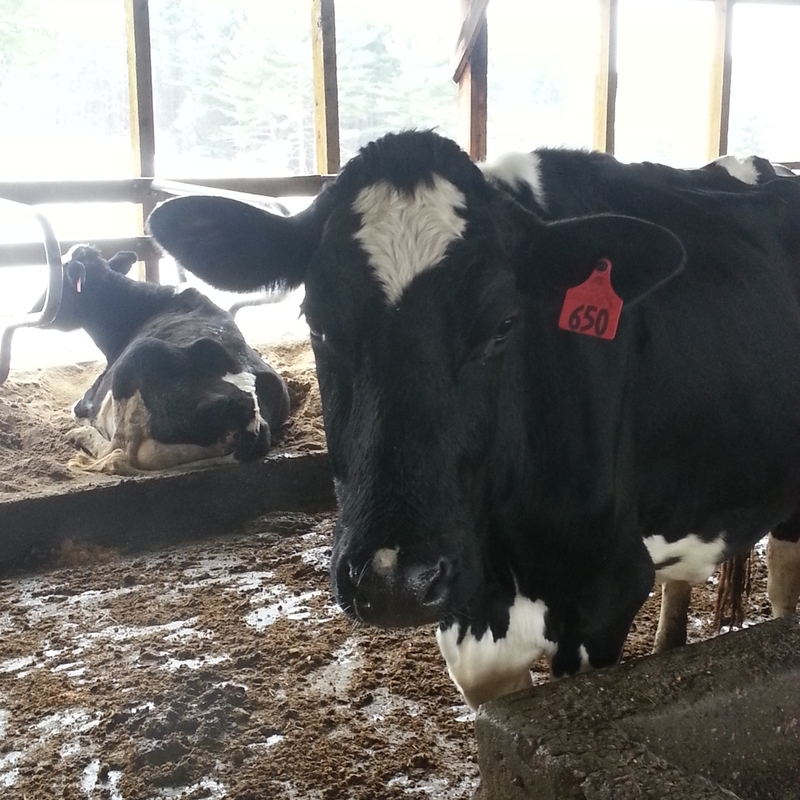 Jerseys produce milk very high in butterfat. They originated on the Isle of Jersey in the English Channel. 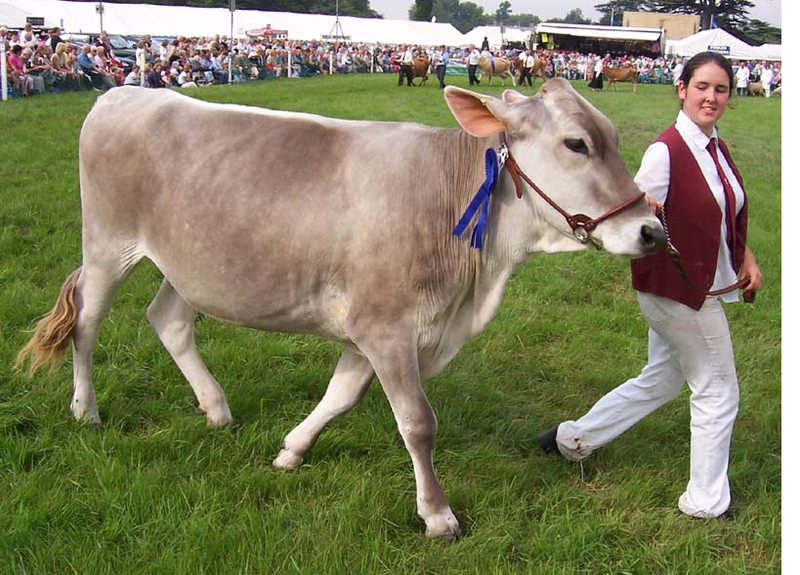 The Brown Swiss breed originated in Switzerland (big surprise there). They are a mousy gray ranging from very light to very dark. With large big boned frames, they end up averaging about 1500lbs. 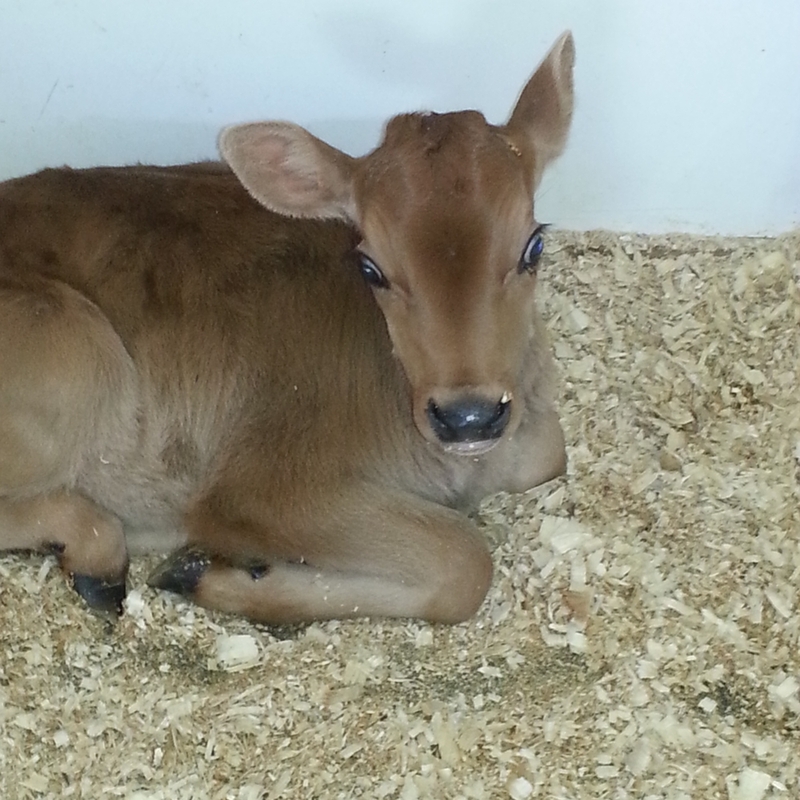 Brown Swiss are known for being docile and heat tolerant, but do not produce as much milk as Holsteins. They produce milk with average fat and protein. Brown Swiss can still found wandering the mountain meadows of Switzerland with cow bells slung around their necks. Referred to at times as the “Royal breed” or “Golden Guernsey” because of the golden color of their milk, the Guernsey is a medium sized cow weighing an average of 1200lbs at maturity. They are a shade of fawn in color with some individuals possessing some white spots. I like to think they look like the color of coffee milk. The Guernsey is an efficient cow and produces milk with high fat and protein content. The golden color of their milk is attributed to high levels of beta-carotene in the milk . The breed originated on the Isle of Guernsey which is a small island in the English Channel off the coast of France. The story goes that they were developed by a group of warrior monks who were sent to the island to defend it (I wonder if they rode cows into battle). The Ayrshire cow is known for being hardy and tough, drawing from its origins in Scotland. They are an average sized breed, weighing about 1200lbs when mature. Their color varies from light to deep cherry red, mahogany, brown, or a combination of these colors with white. Occasionally, you find one that is all white. They were originally imported to the U.S. in 1822 to graze the rugged terrain found in New England. Ayrshires also have a reputation for having a bit of an attitude, which can be helpful when they are in mixed herds with larger breeds. They produce an average amount of milk, with average amounts of fat and protein. The Milking Shorthorn originated in Northeast England and is one of the oldest breeds of cattle in existence. They began their service as an all-purpose breed producing milk, beef, and male offspring to use for oxen. Over the years they have been bred to be more of a milk specific breed but their versatility was a great asset to the early settlers. Shorthorns are either red, white, red and white, or roan (a very close mixture of red and white, and found in no other breed of cattle). They are slightly above average in size, with mature animals weighing about 1400lbs. The Shorthorn is known as a docile creature that makes a fairly good amount of milk. So there you go, a basic overview of the breeds of dairy cattle you are most likely to see venturing throughout the U.S. Just don’t forget, brown cows don’t make chocolate milk.